District Social is located in the heart of New York City's Garment District, just steps from Madison Square Garden, the attractions of Times Square and Broadway's vibrant theaters. Our menu, developed by renowned Chef Harrison Mosher, blends styles and flavors from around the world to create a dining experience that is quintessential New York. Complemented by our selection of wine, locally sourced craft beer and thoughtfully composed cocktails, we are sure to have something to suit every taste. 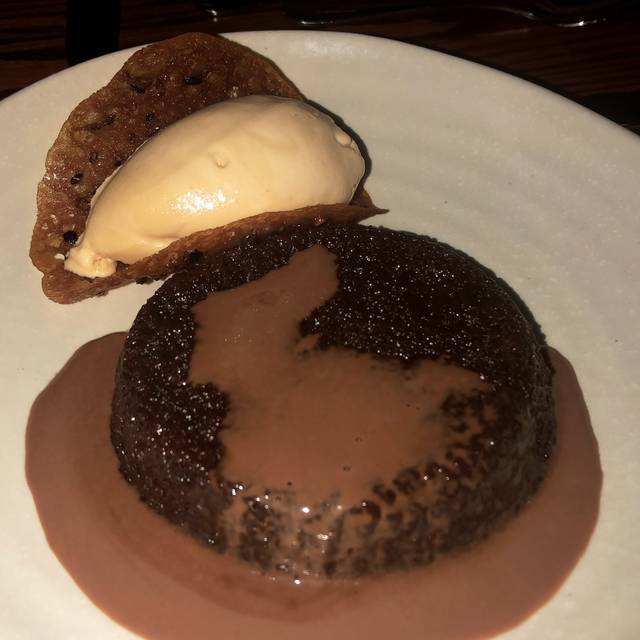 always a wonderful meal with great service- i have never had a bad experience with the service or food - and recommend District Social to anyone looking for a really good meal at a reasonable vost - really good value for money spent and the quality of the food. Food was great! Waitstaff was friendly and provided great service. The mussels in particular were delicious! Had a great waiter who was very personable and knowledgeable. The food was good and very plentiful. With several parties in the restaurant, the noise level was very high for dinner. I would recommend people to go to this place. Super convenient to Penn Station. Good food and service. Comfortable seating but high noise level particularly at dinner time. Challenging to carry on a conversation. Huge Friday night bar scene. Enjoyed the salmon at lunch and dinner. The food is good. The service is so-so. The noise level is deafening. Hangar steak was sopping with a too heavy cumin sauce. Lamb tangine was light on lamb. Branzino meh. Chicken was good as were scallops. lava cake dessert delish. Spinach salad was good. Croquettes were tiny and not very flavorful. 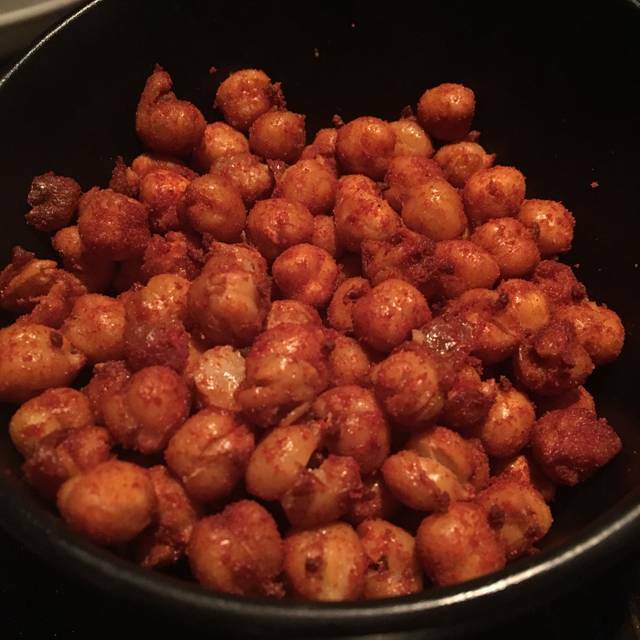 This was a Tuesday night - so maybe meal prep was a bit off? How can one screw up hangar steak? Keep it simple. Was nearly empty at 12pm on a Monday for lunch! Great food. Limited brunch menu, not what we expected or saw online. The cucumber and tomato salad was minuscule. My husband did not eat it because the dressing was odd tasting. The brisket sandwich was just ok. Wine was ok. Prices overall were high. Lunch order was shared by 2 and ended costing over $100 for 1 salad, 1 entree and 4 drinks. There are so many better places in that area but it was a rainy day and we considered leaving but because of the weather decided to stay. It was not a good decision, we will not be going back. We were pleasantly surprised by this casual, reasonably-priced restaurant near MSG! Greg, our server, was excellent! He was knowledgeable and professional, but friendly too. He gave a perfect recommendation for a wine pairing. We had the salmon dish and the lamb tagine - both were delicious! The chocolate dessert was okay, but not great. Atmosphere was casual, but service and food were like fine dining. We will definitely go back - the only hard part will be forcing ourselves to try something new from the great menu, because we already want to have the salmon and lamb again soon! Despite the somewhat chaotic atmosphere, and the noise level, at its core we found this to be a very good restaurant with excellent service. I'm already looking forward to coming back. For a date it was difficult. The 2-seaters hard to hear each other with all the noise going on with the bar crowd near by even though I asked for a quiet and cozy place. Food was just god awful. Reheated mussels were not hot. The calamari was cut up into little peices and reconstituted into a little pancake. Weird. Dinner with friends. Food was good. Loved the Brussels sprouts and cauliflower sides. My fiancé took a day trip to NYC to do our engagement shoot. 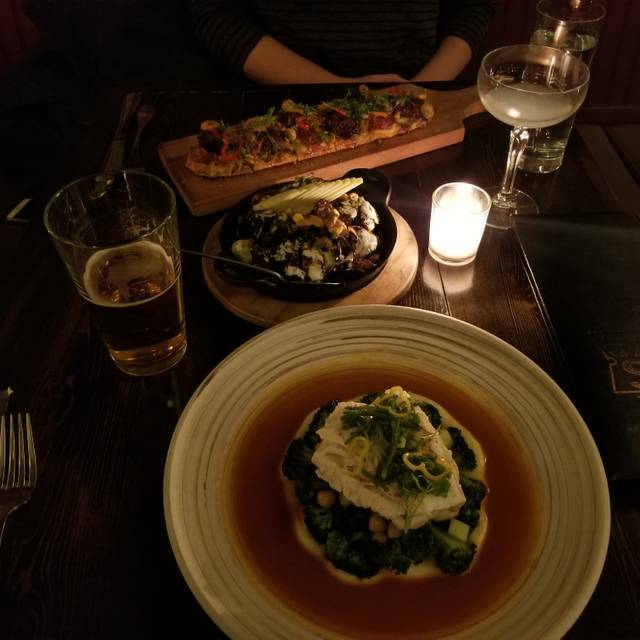 We were looking on yelp for somewhere to dine close to our bus stop and came across District Social. Terrific first dinner at this restaurant, it did not disappoint! Local, intimate, non- chain, upscale dining. They had great service, nice wine selection, and a wonderful menu. My fiancé said the pork chops were amazing... love the ace pineapple cider. We will be returning here soon! The food was amazing. 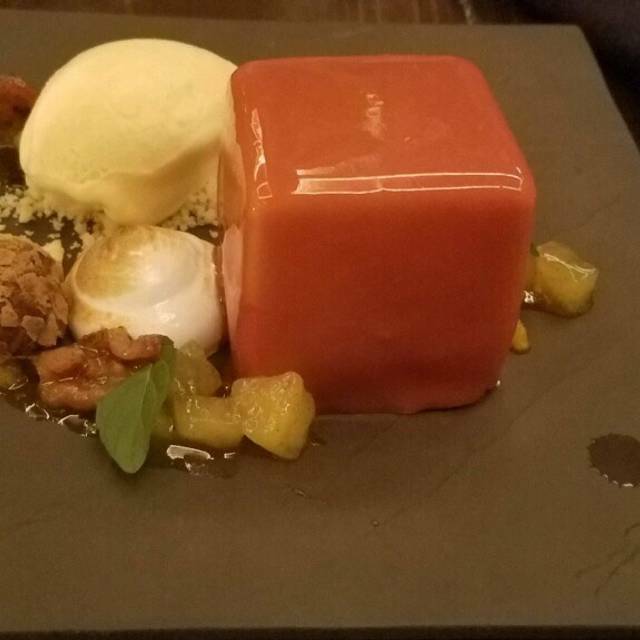 Delicious and presented beautifully exactly as I would have expected. The service was fine except for the fact I felt rushed. From ordering our entrees to after the meal, I felt as if we were being rushed out the door to maximize turnover. As someone who worked in the industry for many years, I know how to not linger and take up a table. I also know if I do linger because I am more interested in my dining party than your turnover statistics, I will make sure I tip my server accordingly to compensate for taking up that seat. I do not need to feel pressured to leave as soon as I am done eating and in this case, I felt like I needed to attach a ball and chain to my water glass and chug the rest of my beer! Busy yet fun, with good food and great service! Attentive hostess and bar staff despite the crowd. Love this place! Service is great! Food is wonderful! Love the menu! Love the atmosphere. So convenient to the garden. Def one of our NYC faves. HOPE TO BE BACK SOON! Must order the croquettes!! 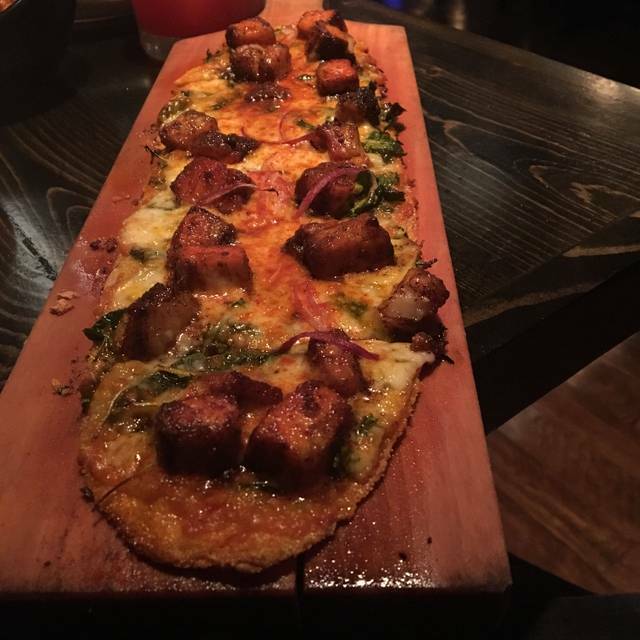 Good food, lots of vegetarian options, good cocktails, close to the theater district! Beer list is impressive as is the food. At first we were hesitant about the food since we were looking for “typical “ fried bar food. No wings, fries, burgers or pizzas, but the whole menu ended up being delicious “ elevated” tavern food. Out table of 10 loved everything and the service was top notch... cleaned up plates quickly and were always ready for another drink order. Special thanks to our kind French waiter!!! We arrived on time for the reservation (early in the evening). The table was ready, and we were attended to quite quickly by our server. As starters, we ordered one of the croquette choices and the bacon appetizer, both were very good. The main meals were the short ribs (considered good) and the salmon (which was excellent). It was Happy Hour so the drinks were both reasonably priced and of good quality. In summary, an excellent location for events at MSG with a nice ambiance and recommended food choices. We were quite happy with this selection. Very good drinks and food. The service was on a slow side but everything else was perfect. 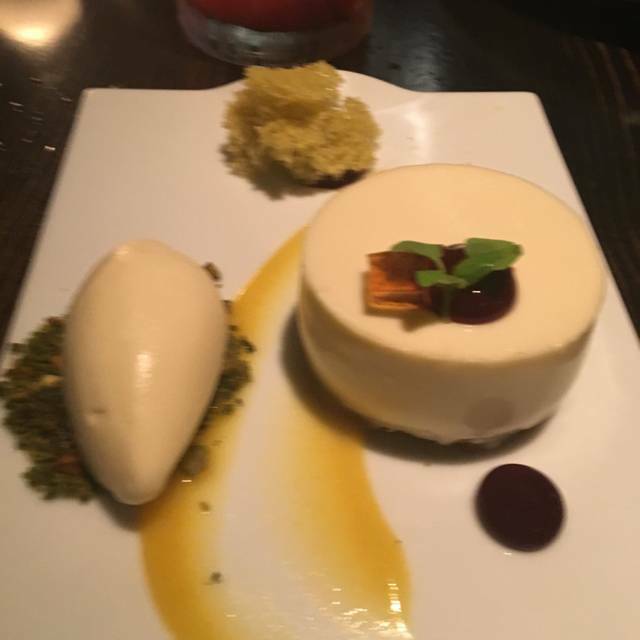 Don't forget to try the desert! Convenient buzzy moderate price theater district drinks and snacks-that’s the good news. But the drinks are too sweet and not well chilled, the food is meh, and the service is clueless and spaced out-waiters can’t answer simple questions, disappear, check takes 20 minutes. Ok but not recommended. Get the brussels sprouts. It is excellent. Had a veggie burger which was really good as well. This is not a bad place for a lunch meeting. There's a Soho vibe to this restaurant, and the food is equally eclectic but delicious. I think it's a great place considering it's right near Penn Station. The noise level was a little intense. In the city to see Elton John. Restaurant is in a great location. Short walk to MSG. Delicious food. I was there in December and sat downstairs. This time I was seated upstairs. It was quite noisy. Otherwise the night was great. I will recommend to family and friends. Linguine dish with black garlic was outstanding! Service was great. Only complaint I have is that they were a little too quick to take the plates. 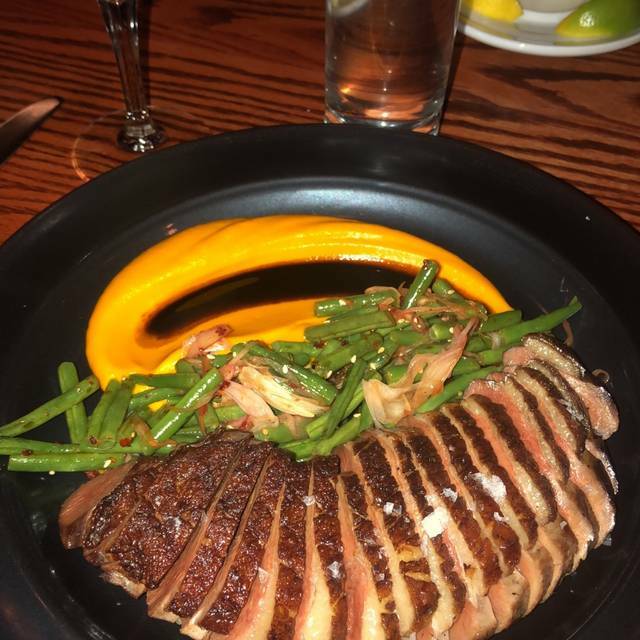 Loved our experience at District Social! Cozy dining area with dim lighting. Great service. Delicious Moscow mule with pear. Menu with all kinds of options like croquettes, flatbreads, yummy appetizers. Meals came out in a timely manner as well. Good vibe. Will go back for sure. Popular place, glad we had gotten reservations early for our group of 8. Even though it was busy- full downstairs and up, and a social event happening our servers were super attentive, always smiling and very quick with service. We didn’t feel left behind in all the commotion. Food was awesome- we had a mix of people and all found something they liked! Drinks were great too. Very busy, loud bar scene. Server was nice and helpful. Food was good, nothing special. Definitely a spot for a friends night out, not a date. I went with my boyfriend right before a concert and we could barley hear each other. However, the host was so accommodating and gave us a quaint 2-top on the second level which was a bit quieter. Our server was great, greeted us right away, made sure we always had drinks, and got us in and out in time for our show. We had the shrimp flatbread (9/10) and the beet salad (7.5/10). 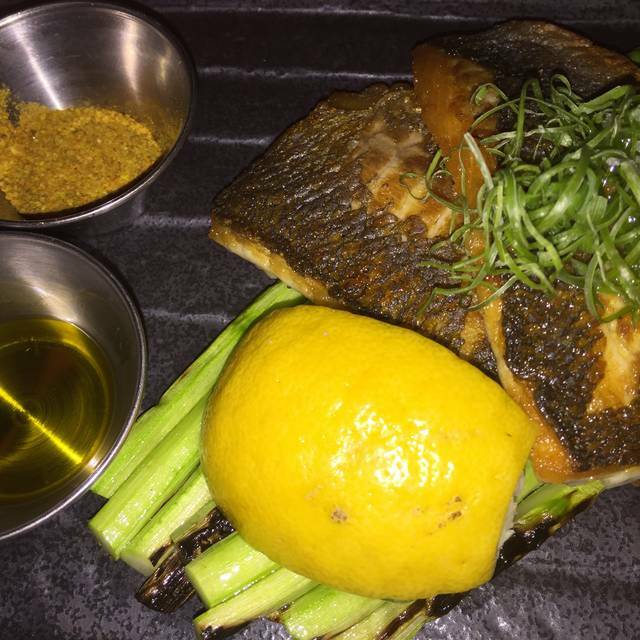 And I got the Bronzino which was delicious (8.5/10), just wish the asparagus was a bit more cooked and seasoned and my boyfriend got the gnocchi (6.5/10)- wish it had a bit more flavor and creaminess. Overall, it definitely has a happy hour vibe. We would go back but with a group of friends next time to enjoy their awesome drinks and great selection of wines! 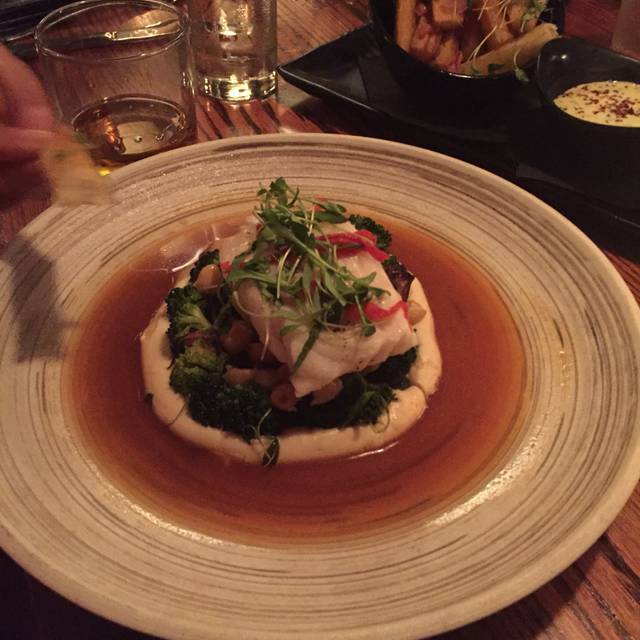 Great service, food was delicious and the atmosphere and size of the location made it a great place to be. Very good food and excellent service, albeit a little overpriced even for midtown. I came here for lunch with my family and we were not impressed. It took us asking twice and waiting for 15 minutes to get water. My mom asked the waiter if she could order a salad and get chicken on top and they would only do that "for their lunch menu" and this was brunch. My dad got eggs benedict and the eggs were cooked fully through, not runny like they're supposed to be. The place was not busy enough to have slow service, and I will definitely not be returning. Went for pretheater brunch. They moved us and everyone rapidly but not rushed. Service and food were very good. Very reasonable. All meals were 15 to 20$. Would happily go back. Considering a group work event here, because location is by all transportation. I was very impressed with the quality of the food and its cost. It's not every day you find a place in NYC with good food that doesn't cost you an arm and a leg. I will absolutely be going back.